Abrasive Discs incorporate transparent grinding zone. Z-THRU(TM) flap discs feature laser cut flaps, precisely layered to create transparent grinding zone that let users view work piece while grinding. Made from zirconia alumina grain, high-grade cooling agent, and heat-treated poly/cotton backing material, discs may be used for blending, finishing, and rust removal and can be used on carbon and stainless steels. They come in 4Â½ and 5 in. dia, with 40-, 60-, and 80-grit sizes and 7/8 in. or 5/8-11 arbor holes. Z-THRU(TM) flap disc line. Z-THRU flap discs have laser cut flaps precisely layered to create a transparent grinding zone, enabling users to view the work piece while grinding. This ability provides users with complete grinding control allowing for fewer errors and improved production times. Z-THRU flap discs are made from zirconia alumina grain, a high-grade cooling agent, and a heat-treated poly/cotton backing material for long lasting, smooth grinding action. Z-THRU flap discs are ideal for blending, finishing and rust removal and can be used on carbon and stainless steels. The new flap discs are available in 4-1/2- and 5-inch diameters, 40-, 60-, and 80-grit sizes and 7/8-inch or 5/8-11 arbor holes. "Z-THRU flap discs allow for precise grinding. By seeing what you are grinding, users don't have to interrupt their work to get to their exact stopping point." said Joe O'Mera, president, CGW-Camel Grinding Wheels. Z-THRU flap discs are demonstrated on CGW's USA site, www.cgwheels.com. Click on "See Our New Product Videos" located in the "What's New Section" on the main page. 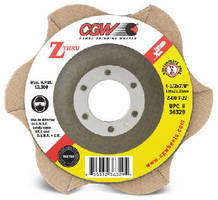 CGW-Camel Grinding Wheels is a leading manufacturer and supplier of abrasive products - resin and vitrified bonded grinding wheels and cut-off wheels, flap discs, coated and super abrasives since 1956. Its 90,000 square foot USA facility serves as a centralized warehouse with manufacturing capabilities and includes customer service, sales and marketing departments. 800-447-4248. Fax: 800-447-3731. Web site: www.cgwheels.com. Abrasive Discs cut titanium and brass.